ca 450 - 400 B.C. Detail of three of the younger Charites (Graces)--Eudaimonia (Happiness), Harmonia (Harmony) and Paidia (Play)--from a painting depicting the retinue of the goddess Aphrodite. 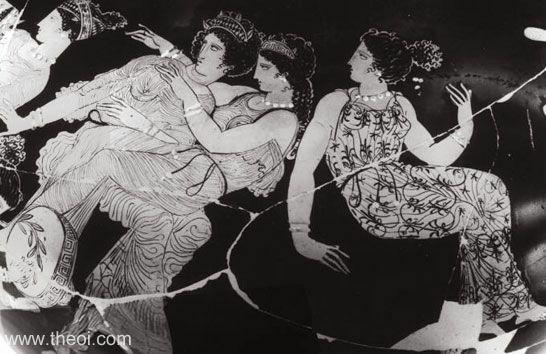 Other figures in the scene (not shown) include the Erotes (Loves), Eurynoe, Pannychis (Night Festivity), Chrysothemis (Golden Custom), Hygeia (Health), and Pandaisia (Festivity).